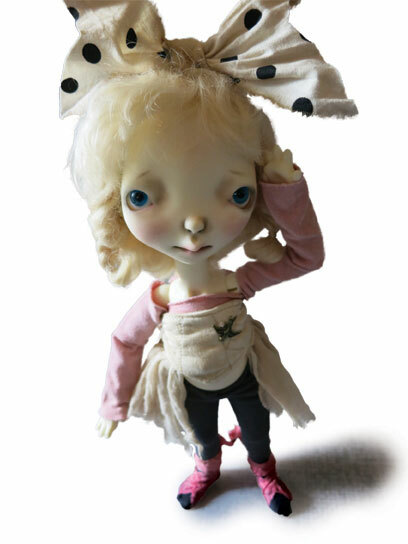 In the 26 years she’s spent in the doll industry, Virginia Turner has just about seen it all. “When I first got into it, there were—at most—maybe 20 booths at Toy Fair,” she recounts. “A few years ago, we counted 370-some-odd doll artists!” While the field of people making and selling dolls has grown more crowded, Turner Dolls always strives to stand out. That’s one of many reasons why DOLLS magazine—itself celebrating a quarter century this year—is proud to honor Virginia Turner with the Lifetime Achievement Award. At the 2007 Doll & Teddy Bear Expo in Washington, D.C., in August, Jones Publishing founder Joe Jones presented her with the award and hearty congratulations for so many wonderful years of delighting doll lovers. “I feel humbled, surprised and appreciated,” Virginia says. Unlike many of today’s doll artists, Virginia Turner wasn’t particularly fascinated by dolls as a girl. She was born in 1936 and her childhood coincided with World War II, when nearly everything was sacrificed for the war effort. “The only doll I remember getting, her composition was cracked,” Virginia re­calls. Plus she had her hands full helping to take care of four brothers! Virginia’s parents were both artists, and she grew up with a love of art. When her daughters Julie, Susan and Teri were small, Virginia made clothes for their dolls. So she was well prepared for her accidental entry into the doll world. In 1981, Virginia was working in a bank, her husband, Boyce, managed a porch swing factory and did woodworking, and Boyce’s sister Judy Turner was designing dolls. She needed extra help filling an order, so Virginia and Boyce started making porcelain in their North Vernon, Ind., basement. 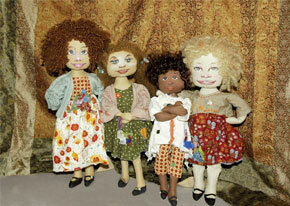 The trio soon formed Turner Dolls, selling Originals by Judy and a line of reproductions called Virginia’s Very Own. The company grew and grew—literally. In 1986, the Turners inherited a 40-acre farm in Heltonville, Ind., and converted it into doll central. Boyce “made a nice studio” out of the farm’s smokehouse, Virginia explains, and other structures were built to house manufacturing facilities, a fabric and photography studio, and a doll shop. Within a few years, Judy opened a separate doll business. Meanwhile, Virginia had her hands full with her own creations. 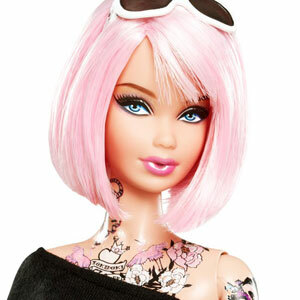 She sculpted her first original porcelain doll, “Jeannie,” in 1989. The edition of 500 “sold out as fast as we could make them!” Virginia says. A few years later, she released her first foray into vinyl, “Kitty Kay,” another hit. That success continues, with Turner Dolls producing thousands of American-made dolls every year, to the smiles of collectors everywhere. Take one look at Virginia’s wide-eyed infants or giggling toddlers and you too will have a hard time suppressing a grin. What’s her secret? “I’ve always been a person who likes realism, such as that of Norman Rockwell,” Virginia reveals. She strives to capture authentic ex­pressions and realistic de­tails. Fifteen years ago Virginia even spent two weeks in France studying with a master sculptor to improve her ability to create lifelike dolls. 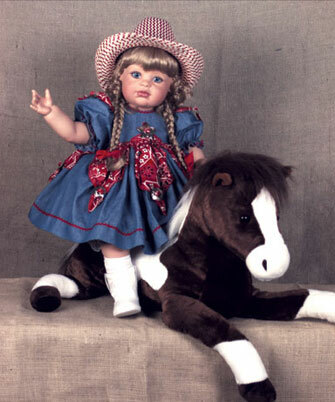 Turner Dolls is also famous for offering some of the last mass-produced dolls made in the United States. From the original sculpts to the vinyl and porcelain production to the costumes (all designed by Virginia), everything is done by the Turners and their employees on the farm-turned-factory. Lately, to give the dolls even more authenticity and value, Virginia has taken to hand-painting the eyebrows. So now no two dolls are exactly alike! This devotion to homemade quality has won Turner Dolls widespread ac­claim. “Customers like the fact they’re made in the U.S.A., and the detail work,” says Brenda Grooms, manager of Christmas & Dolls in Pigeon Forge, Tenn. Everything is exquisite, from the trim or edging on a dress to the shape of a doll’s lips, showing just how much time and effort the dollmakers put into getting everything just right. That all stems from Virginia, of course. “She’s a perfectionist!” Grooms notes. “Virginia’s dolls are always of the finest of quality,” says Debbie Bibb of The Doll House in Edmond, Okla. “The clothing is always so nice and detailed.” In addition to her personal stash, Bibb adds that her daughter owns 37 Virginia Turner dolls! That friendly, down-home mid-western spirit is on display whenever Virginia attends a doll show or signing, according to Grooms. “It’s like meeting a family member you’ve not seen in awhile,” she explains. “She’s a wonderful person.” As proof, Grooms recalls how Virginia brought an order of dolls with her to a signing, eliminating the shipping charges. 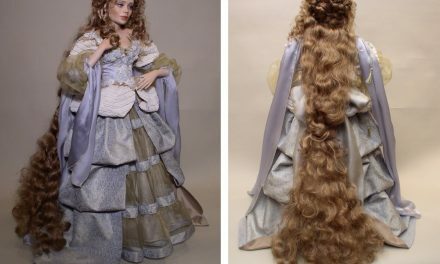 “I even have a doll named Brenda that Virginia named after me,” Grooms says; Virginia gave her the first doll in the series.